Attack on Titan Season 2 Premiere Date Announced: Good news for the fans of Attack on Titan Anime fans, as Funimation has announced for the release of Season2. The release of anime is confirmed but the exact release date is yet to be announced. It is fine that Attack on Titan fans should not wait for more time for next season. The confirmation on season 2 makes that anime will come soon on air. It has been a long time from the release of Attack on Titan, but the hope of audience was never lost. Now finally we have the anime getting its continuation released with more titans characters added. Attack on Titan is known as Shingeki no Kyojin in Japanse and it known to be ironic anime series. Getting in deep with the meaning it is known as the Advancing Giants. Attack on Titan is from the Manga adaption by Hajime Isayama’s. It was in 2013 when the anime got its 25 episodes released and gave a hope at the end of 25th episodes for next season. Since then fans were waiting to know what is going to happen with titans. We in this article bring you the updates on Attack on Titan Season 2 Release Date along with the plot. Make sure you don’t miss this anime as it is one of the most popular and entertaining anime series. Story is all about the man eating monsters called as Titians. Who are giants and still plaguing in the city called Shinganshina. It was unknown how these giants came into the city and attacked the human civilization. Whole city was destroy by this Titans den there was only few part of human left behind three walls. Wall Maria, Wall Sheena and Wall rose were three walls protecting the human kind. Our lead character protagonists Eren Yeager along with her sister Mikasa and friend Armin are now filling to come back with some action. In season 1 it was shown this characters were panic when they came to face the monster and defeat them. But in Attack on Titan Season 2 they are not going to be the same, stronger then before end bolder then past. It happened that the Wall Maria has been destroyed by Titans and they are heading towards the second wall. So Eren, Mikasa and Armin are making in hurry to get stronger and protect the mankind. As it is already known that the story is more left as the war between the left over humans and Titans is still there. It is unknown that what will happen if Titans come inside the human’s area by breaking three walls. Keep waited for more updates on plot of Attack on Titan Season as there is lot more to come over. Perhaps the story is being prepared for season 2 and soon the anime will continue with next season. As per rumors and announcements made from the official account of Attack on Titan Anime, the release date of Attack on Titan Season 2 will be soon released. The continuation is confirmed and it will end up this year of sure. 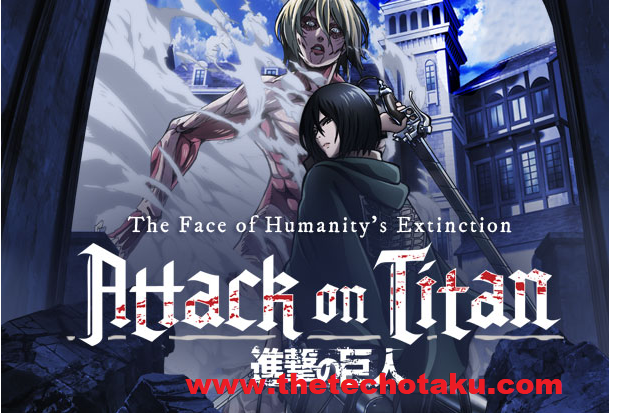 Keep visiting our site to know more about the Attack on Titan Season 2 and also have a look at other anime series too.